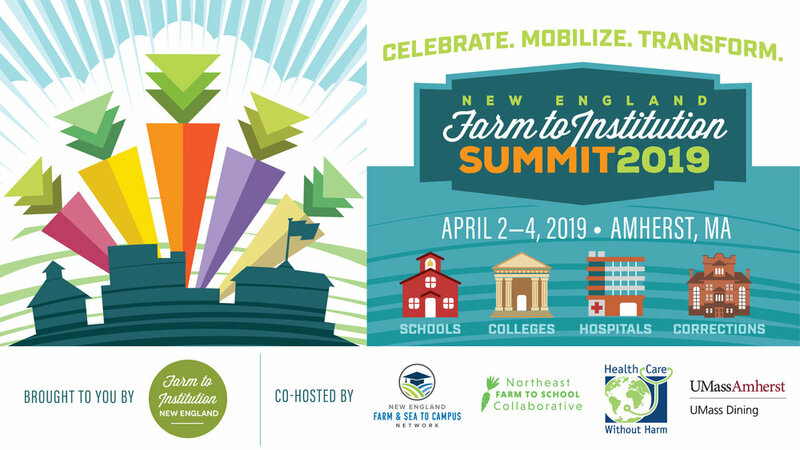 The 2019 New England Farm to Institution Summit is brought to you by Farm to Institution New England (FINE) in collaboration with Health Care Without Harm, UMass Amherst, the Northeast Farm to School Collaborative, and the New England Farm & Sea to Campus Network. Farm to Institution New England along with our partners UMass Amherst, Health Care Without Harm, the Northeast Farm to School Collaborative, the New England Farm & Sea to Campus Network are pleased to announce the third biennial New England Farm to Institution Summit, which will take place on April 2-4, 2019 at the University of Massachusetts Amherst. Since the first gathering in 2015, the New England Farm to Institution Summit has become a seminal event for stakeholders working to transform our regional food system. More than 500 participants are expected at the event, including foodservice operators, producers, supply chain businesses, advocates, public officials, and others dedicated to this work. The summit seeks to bring together an inclusive, diverse regional network of individuals and entities across all parts of the food system. The summit will feature programming that focuses on farm to school, farm to campus, farm to health care, and farm to corrections, as well as cross-sector themes. We welcome both newcomers and pioneers on the forefront of the movement to inspire change and generate energy through sharing best practices and innovative strategies; enhancing network capacity through skill building; and strengthening our collective impact by engaging leaders and policymakers in shared problem-solving. The New England Farm to Institution Summit is designed to identify issues that cut across the sectors and the region, highlight important successes and achievements in farm to institution in the region, develop collaborative strategies to pursue, inspire and engage participants on important and challenging work, and show connections between sectors, states, and supply chain stakeholders. Do you have an innovative idea, a set of best practices, or a policy proposal to share? Has your institution been leading the charge to improve our food system? Are you a student mobilizing your school to support regional producers, protect the environment, and pay food chain workers a fair wage? Are you running an institutional dining program while tracking your sustainability impact? Are you a regional producer selling to institutions? Do you want to brainstorm some big solutions with other great food systems practitioners in the region? This conference is for you! Registration is now open! Early bird rates are now available until March 1st. We offered dozens of partial scholarships to people who requested financial assistance to attend the #F2ISummit. It is our goal to provide opportunities for the full diversity of farm to institution constituents to attend the New England Farm to Institution Summit. Thank you to our generous sponsors that make this possible. The New England Farm to Institution Summit program is chock full of engaging sessions, inspiring speakers, exciting tours, fun social events and more! Get the latest at www.f2isummit.org/program. The exhibitor fair at the #F2ISummit will be a great opportunity to promote your products and services, build awareness around your mission, strengthen relationships and meet new customers and collaborators! Questions? Suggestions? Contact us at summit@farmtoinst.org. When you create social media posts about New England Farm to Institution Summit, use the hashtags #f2isummit and #farm2institution. Keep us in the loop about how you or organization is preparing for the 2019 New England Farm to Institution Summit by tagging us in your social media posts or stories. Newsletter/Email/Blog: Registration for the 2019 New England Farm to Institution Summit on April 2-4, 2019 at UMass Amherst in Amherst is now live! Early bird rates are available now through March 1st. The #f2isummit program will feature a dynamic and inspiring array of sessions, speakers, activities, cooking demos, field trips, exhibitors, entertainment, and networking time. This three-day conference includes farm to institution programming that focuses on farm to school, farm to campus, farm to health care, as well as cross-sector themes. You can expect dozens of exciting breakout sessions on topics such as food production and processing; transparency and traceability; community health; culinary innovation; Farm Bill updates; financial analysis; food waste; and so much more! Join us for career networking opportunities, an exciting exhibition fair, and four unique field trips. The 2019 New England Farm to Institution Summit is hosted by Farm to Institution New England in partnership with Health Care Without Harm, the Northeast Farm to School Collaborative, the New England Farm & Sea to Campus Network, and UMass Amherst. Visitwww.f2isummit.org/register to learn more and register today! 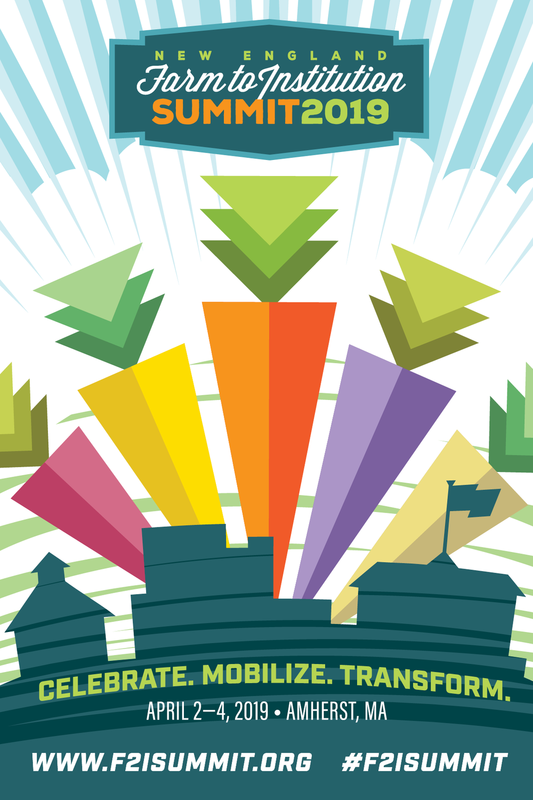 Facebook & Instagram V1: Registration is now open for @farm2inst‘s third biennial New England Farm to Institution Summit on April 2-4, 2019 at UMass Amherst in Amherst, Massachusetts! Early bird rates are available now through March 1st. The #f2isummit program will feature a dynamic and inspiring array of sessions, speakers, activities, cooking demos, field trips, exhibitors, entertainment, and networking time. You can expect dozens of exciting breakout sessions on topics such as#foodproduction #foodprocessing #transparencyandtraceability#communityhealth #culinaryinnovation #farmbill updates#financialanalysis #foodwaste and so much more! Visit www.f2isummit.org/register to learn more.